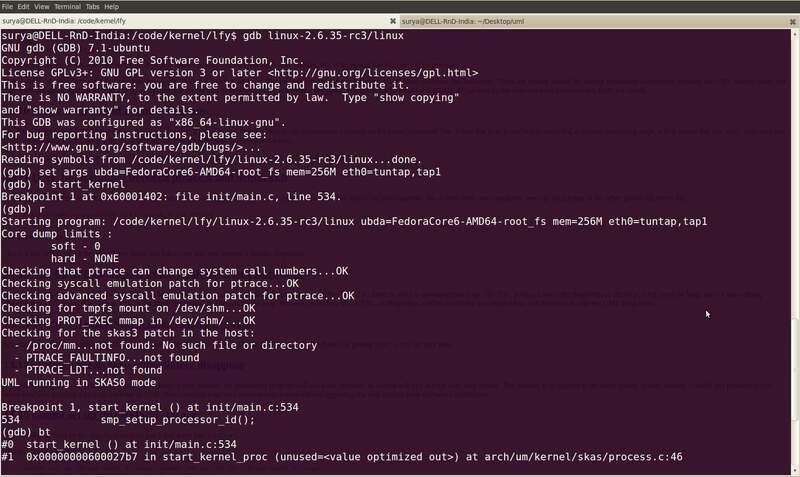 This article gives you hands-on experience in setting up a User-Mode Linux (UML) kernel and getting it up on a running Linux OS. We see how to share files between the host Linux and guest Linux, via the network and other methods. We also cover building a custom kernel, building modules for the UML kernel, inserting them into the running UML kernel, and debugging the kernel and modules with GDB. 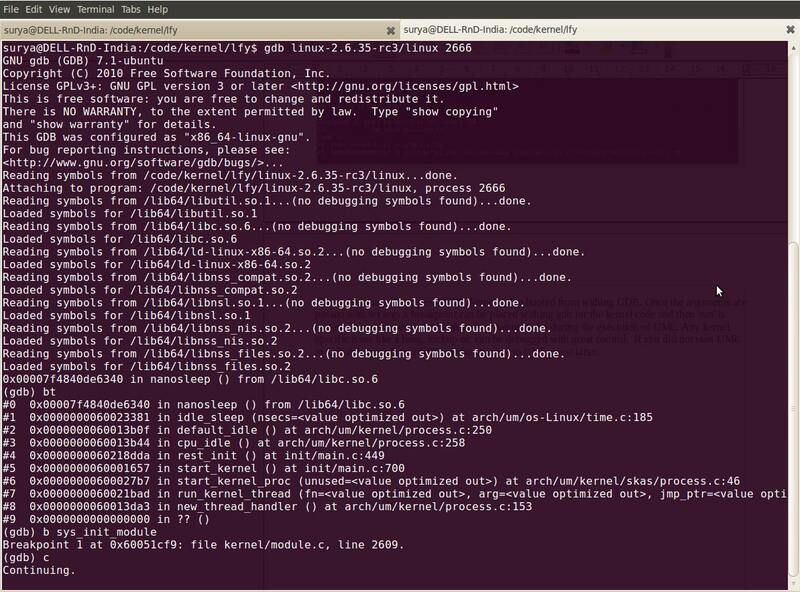 UML gives you the advantage of running Linux on top of a Linux distribution, without the need of privileged access. It is run in the form of an unprivileged user program, giving the end user power to play with the OS. The Linux kernel, once compiled to the UML architecture, creates a machine-dependent binary which can execute itself, and launch the UML kernel. UML was developed by Jeff Dike, and has been part of the vanilla Linux kernel since version 2.6.0. It is very useful for kernel developers to quickly test new code; and for administrators, to build sandbox Linux virtual machines and honeypots, while deploying new services without disturbing the production environment. Most steps mentioned in this document are distribution-agnostic, and can be tried on any Linux machine with the x86 or x86_64 architectures. Figure 1 depicts a conceptual layout of UML in relation to the hardware, host kernel and user-space. Enter the directory in which it was extracted (I’m using /code/kernel/lfy/), and issue the following command to compile the kernel for the UML architecture (view Figure 2). ARCH defines the architecture for which the kernel is to be compiled; in this case, “um” stands for user mode. The make menuconfigcommand gives us an ncurses-based interface in which we can configure build options for the UML kernel. See Figure 3. Compile the kernel with debugging info (see Figure 4). Compile the kernel with frame pointers. ‘Enable loadable module support’ in the main menu. 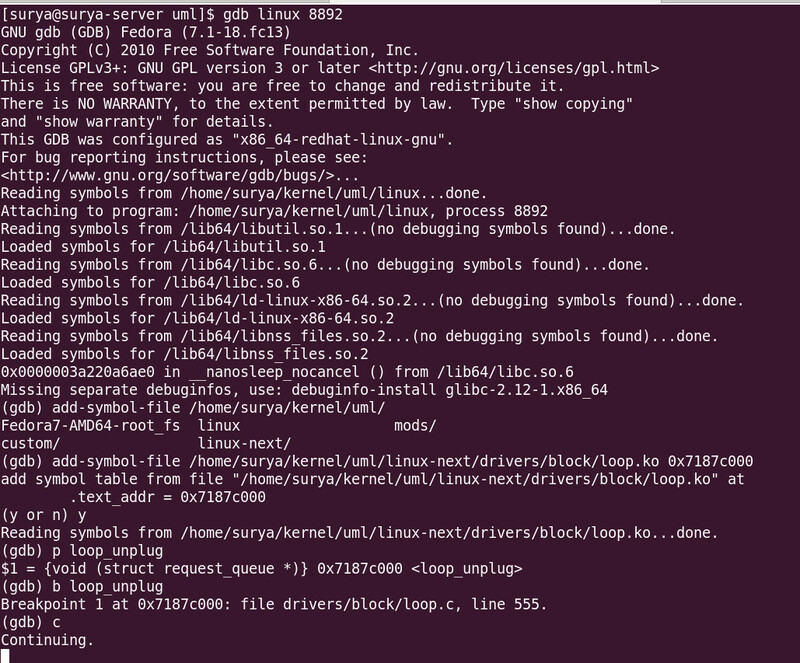 Once the kernel compilation is done, you should have a binary named linuxcreated in the same directory; see Figure 5. Kernel modules need to be installed in a directory (of the host system), so that we can later copy them to the /lib/modules/ path inside the UML system. In my case, the target directory is /code/kernel/lfy/mods. 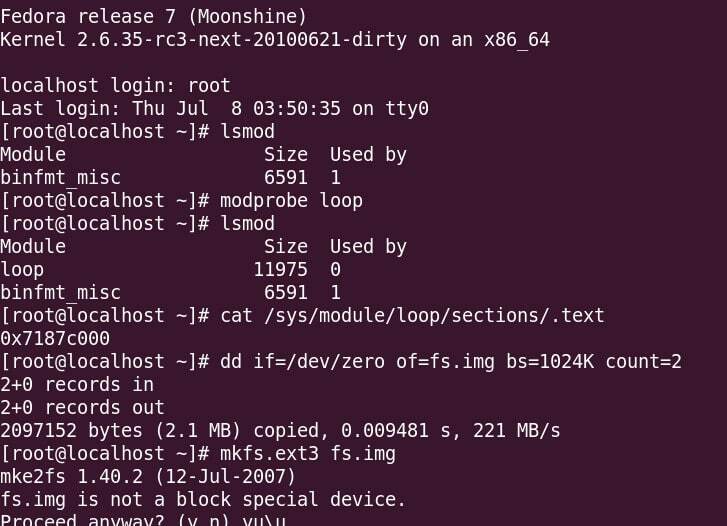 This adds 1 GB to the end of the root filesystem file. Be careful to use the >> (the double greater-than) redirection operator to append to it; if you use the single greater-than symbol, the rootfs will actually be an empty 1 GB file. Now we are ready to boot UML for the first time. In this command-line, ubda specifies the filesystem image that is to be used as the root filesystem. If you need to pass more than one filesystem image, use arguments like ubdb, ubdc, etc. The optional mem parameter specifies the memory (RAM) that is allocated to the UML (it defaults to 128M if not specified). Access the host filesystem in the UML instance, and copy the previously compiled kernel modules to UML’s filesystem. This can be done in various ways; I am highlighting a couple of methods here. Once the host directory is mounted, copy the module files to /lib/modules of the UML instance, with a simple cp command. As mentioned, use scp to copy the modules, or create an NFS share from the host, mount it in the UML instance, and copy the modules. Note: This setup assumes that there is a running DHCP server in the host’s network. If this is not the case, interface br0 on the host and eth0 in the UML guest have to be assigned static IP addresses. We need to remember that the UML system lies in the same network as the host system, in this setup. We follow this model of setting up the network because if administrators want to provide sandboxed UML test environments for users who need full privileges, they would either need the UML instances to be on the same network as the host, or would need to configure a custom iptables setup. Since UML is considered to be an application, it can be debugged with the standard GDB debugger, as follows. Figure 7 illustrates the UML kernel being booted from within GDB. Once we passed the arguments with the set args command, we placed a breakpoint on the start_kernel()function in the kernel code, and then instructed GDB to run the program. As you can see, after UML initialisation, GDB stopped execution when it reached the breakpoint. If you have written a custom kernel module that you need to insert into the running UML kernel, the module needs to be compiled for the UML architecture, with the same kernel version with which UML is running. This will compile your custom kernel module for the UML kernel. Once the module is compiled successfully, you can copy the .ko file from the host system to the UML using hostfs or networking, as given above, and you can then insert it into the running UML kernel. 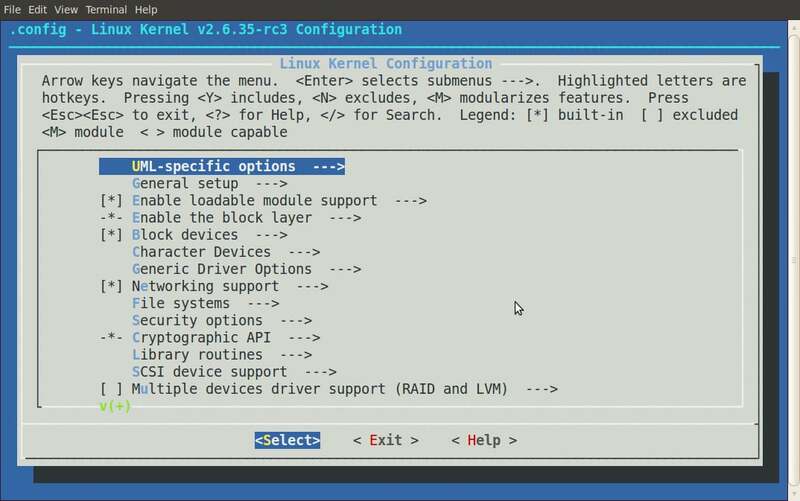 Loadable modules are a great advantage in the Linux kernel. Pieces of kernel code can be dynamically plugged in and out of the running kernel. However, a few of these modules with bugs can cause problems with the system, and need to be debugged. s these modules are inserted in the kernel at a later stage, GDB has no knowledge of the relevant symbol information, or the location of the module in memory. We need to feed this information to GDB, once the module is loaded, in order to debug the module. GDB has a command, add-symbol-file, which takes the .ko module file (which you are trying to debug) as its first argument, and the address of the .text section of the module as the second argument. The .text address can be obtained from /sys/module/<modulename>/sections/.text. In a different terminal window (which you started the UML instance from), find the process ID of the UML instance. Finally, type c at the gdb prompt, to continue running until the breakpoint is encountered. Figure 10 illustrates the above steps. This should hit the breakpoint in the running GDB instance in the host system. We can then view and debug the code of the module. The purpose of this article was to provide an introduction to UML, and a step-by-step guide to setting up a UML system and debugging the kernel and modules. The methods mentioned in this article are one of the many available to set up and play around with UML. For more knowledge on the topic, you can subscribe to the UML mailing lists or visit the UML home page.